Lexpo 2019 was certainly an unforgettable year. The two day action-packed event had everything from great speakers, interesting topics and a range of suppliers showcasing industry leading solutions. For the Bundledocs team this was our first year sponsoring the event. We were thrilled to showcase our electronic document bundling tool to so many and great to hear such wonderful things about Bundledocs. We had a lot of interest from those looking to integrate with iManage, NetDocuments and Tikit TFB P4W - who were all showcasing at the event. Thanks to everyone who stopped by our stand on the day. It was great to meet you all! At Lexpo’19 Bundledocs were delighted to have the opportunity to have our product video shown through-out the 2 day event. If you didn’t get the chance to attend this year, here is the video, so go check it out. Our video covers everything Bundledocs does best - from document bundling, document manipulation, secure sharing, collaboration, OCR, redaction and annotations. Want to give it a try for yourself? Start your free 30-day trial or get in touch to arrange your free online demo. Each year Lexpo explore timely themes that are key for legal processionals. This year was no different and Lexp’19 focused on: collaboration, differentiation, valuation and cyber security. Collaboration is increasingly becoming more important in the life of the lawyer - not only between lawyers and clients, but also between the professional experts working in different practice areas. During the event, Bundledocs were on-hand to showcase our range of collaborative features to help make document preparation, amendments, collaborative working and delivery simple. Effortless Collaboration: Share your bundle, work on it with others, keep copies of drafts. Perfect when you need to work with counsel or any third parties. Secure Share: Securely send drafts or completed bundles to counsel, other side solicitors or any third party. Work in groups: Seamlessly work with colleagues to create your document bundles with ease. Now you can ensure that everyone is working from the same page and there is no more duplication. Interested in collaborating with others? Start your free 30 day trial today now. Lexpo’19 was certainly a busy event this year, so if you didn’t get the chance to check out Bundledocs, then not to worry. Get in touch with us and we can arrange an online demonstration for you. We will show you how to create your bundle, redact, annotate, securely share with third parties and much more. Following this, we offer a free trial so you can fully test it out to see if it suits your requirements. Sound good? We were inspired to write today’s post from a recent enquiry we had about Bundledocs. The user (and now client) was looking for a solution that integrated with their DMS system and allowed them to easily collaborate on bundles with colleagues in different office - without the need to travel. Yes. If you too are looking for a solution to help you securely collaborate with colleagues, other side counsel, clients or any third party, then Bundledocs has a solution for you. In this post we will go through Bundledocs Secure Share; Bundledocs Online Collaboration and Bundledocs Groups. Let’s get started! How it works. Our Secure Share allows you share a password protected bundle with anyone - outside counsel, barristers, other side solicitor, client etc. When you share a bundle using Bundledocs, the recipient will receive two emails: The first contains a unique password and the second email contains a link to download the bundle. Use both to instantly download the bundle. How it helps. Our Secure Share is great for anyone working with large bundles. You are no longer limited by your email limits and can now send bundles of any size to anyone. You won’t need to print and send bundles unnecessarily and can help move towards being a less-paper office. Win. Win. Did you know? Many of our clients are now using our Secure Share feature to share the index or Table of Contents page with others. Simply generate your bundle to only include the index page and then securely share your index with others. Here’s a quick video so you can see it in action: Share Index with Others (Video). Over the last few months we’ve added a number of new enhancements to our Secure Share feature to make it even better. It is now possible to set an expiry date for your shared bundle; set download limits and even type longer messages when sending. How it works. 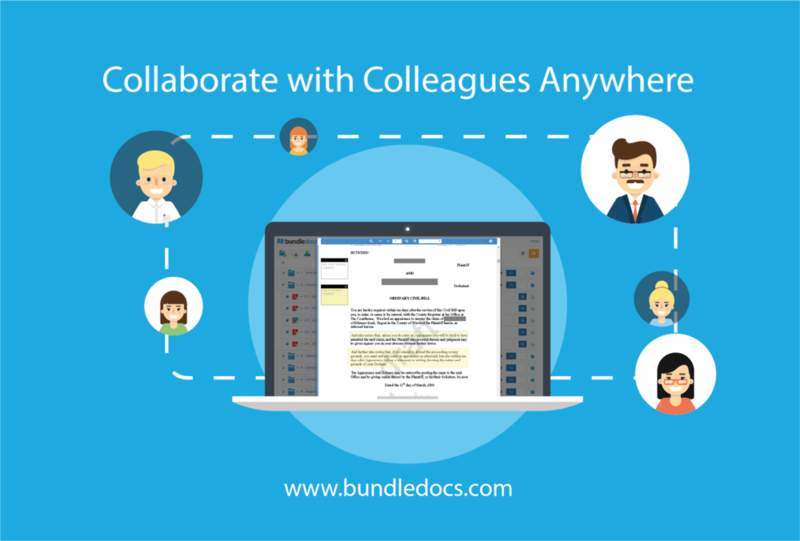 Bundledocs Online Collaboration allows you grant access to others to view, edit and work on your bundle(s). You can grant access to any third party - you control who is allowed access and what access type they have. How it helps. With online collaboration the days of sending bundles back and forth are over. Create one bundle and grant access to anyone that needs it. This feature is great if you need to have a number of people working on a bundle. The best bit? You don’t even need to have a Bundledocs account. It’s automatically created when you send them the invite! Did you know? Bundledocs allows multiple users to work on the same bundle, at the same time. This is brilliant for anyone who’s working on large complex cases. It ensures that when you’re working on a particular section of your bundle, it’s locked for use to another other user. How it works. Bundledocs Team Groups allow you to work together with colleagues on your bundles. Everyone is working from the same place - regardless of which office they are in or where in the world they are. How it helps. You don’t have to wait until the last minute to start preparing your bundles. Build up and modify as the case progresses and remove the last minute stress. Plus with everyone working from the same place you no longer have to worry about duplication. What a dream! Did you know? Bundledocs have introduced Management Groups to help you easily manage your organisations user licences, bundles, access rights, global template and styles - and much more. If you’ve yet to introduce Management Groups in your practice, then get in touch today. We will be happy to show you how it works and offer free Admin training too. Admin Training - Sign Me Up! That’s a wrap. If you’ve any other queries about Bundledocs secure share, online collaboration, team groups or management groups then make sure to contact our team. We will be delighted to show you more. Are you looking for software to help you quickly and easily prepare a family law bundle for court? You’ve come to the right place. Bundledocs electronic document bundling software has everything you need to create the perfect bundle in minutes. So whether you’re a family law solicitor or self litigant, this is the tool you need. Ready to learn more? It’s simple. Bundledocs electronic document bundling software is designed to help lawyers easily create electronic bundles quickly and easily. So how does it work? Take documents from anywhere, adjust the order, group them, redact anything you don’t want included and that’s it. Bundles are instantly ready to save, securely share or print – from any device, at any time. We even handle document manipulation, annotations, OCR and online collaboration. Bundledocs is so easy to use most of our users never had training. There is no minimum contract period (so you can cancel at any time) and there is no install required so you can get going straight away. Did we mention we offer a free trial too? Why not give it a try and see if it suits your requirements. Unable to view? Visit the Bundledocs YouTube Channel to see our document bundling software video and many many more. First let’s create and structure our family law bundle. You can create as many sections and sub-sections as you need. Now that we’ve created our bundle we are ready to add our documents. You can upload directly to each section from the uploads area. Remember, Bundledocs integrates with a range of world leading solutions to make uploading simple. Our integration partners include iManage, NetDocuments, Tikit TFB Partner for Windows, Dropbox, Clio and much more. You can easily arrange and re-arrange files once their uploaded. Then when you’re ready to complete your bundle, all you need to do is hit the ‘Generate‘ button. There are a number of options you can apply to customise each version of your bundle - whether that’s changing the look of your cover page or index page; re-positioning page numbers, adding watermarks etc - you can do it all here. Once you click the magic ‘Generate‘ Bundledocs will instantly merge all your files into a single PDF document. An index page is created that lists all your sections, document and corresponding page numbers. It’s hyperlinked too so if you are using it on your computer you can quickly navigate and get to the section/document with a single click. Each page of your bundle is paginated and numbered and did we mention that we automatically create bookmarks too? Your completed family law bundle is instantly available to download in PDF and this can be printed. Alternatively, if you would like to send the bundle on you can securely share directly from Bundledocs. Amazing! One of the best things about Bundledocs electronic document bundling software is that making changes is so simple. Now you don’t have to wait until the last minute to prepare your family law ebundles. If you make a change (change the order, add additional documents, need to change the look and feel etc.) just click the ‘Save‘ button. This will automatically update everything - the index, bookmarks, links, page numbers. Say goodbye to document preparation stress! Ready to say goodbye to your family law bundle preparation worries? If you’re interested in giving Bundledocs electronic document bundling software a try then you can start your free no-obligation free trial now. Prefer to see how it works first? No problem. Get in touch with our team and we will be happy to arrange a free online demonstration at a time that suits you. We can’t wait to hear from you!